A combination of astonishing imagination and realistically rendered imagery, the painting revives the 1695 idiom of Basohli art - the pioneer Pahari art style and one that outstood all styles of medieval Indian miniature painting as regarded bold and vigorous forms, sharp lively feature with large eyes, brilliant and discreet palette and over-all splendour. Basohli had early tradition of both, Devi paintings and bold forms, but under its ruler Kirpal Pal Basohli painting had its golden period when not only in its massive volume but also in quality Basohli art attained its all times heights. 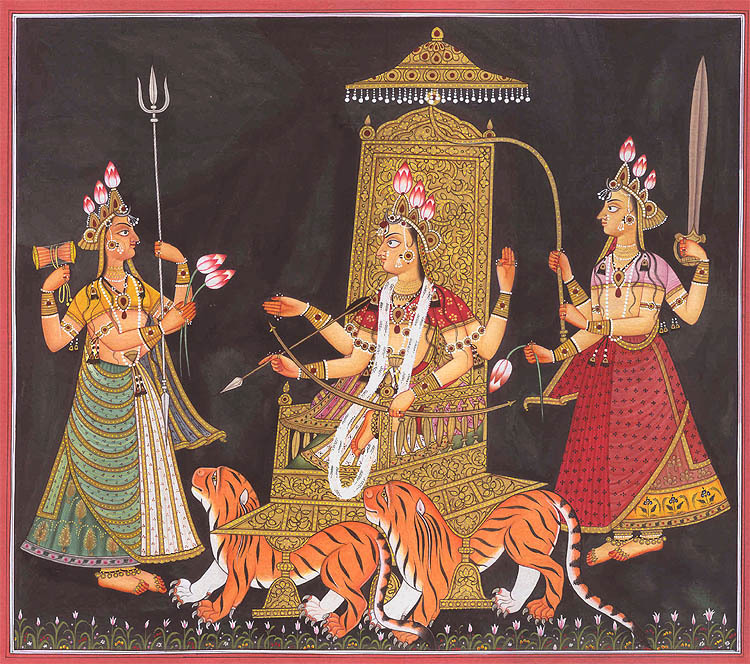 The period is best known for its Devi painting series and Gita Govinda and Rasamanjari illustrations. The Devi paintings and Rasamanjari illustrations, datable to 1695, mark the beginning of this great era, and the Gita Govinda of 1735, its end. The period is also known as beetle-wing period, as for creating effects of brilliance in jewellery and other parts, painters of the period pasted actual beetle wings in place of colours. The painting is identical to a folio of 1695 Basohli Devi painting series now in Sri Pratap Singh Museum, Srinagar, except in its size and in not using actual beetle wings for defining jewellery. As compared to 17 x 20 cm. size of the earlier, the size of this painting is 24 x 27.5 cm. Though an old theme rendered using an early art idiom, the painting is wondrous in its brilliant craftsmanship and in reviving the past glory, or rather in transporting the 21st century vision to 17th century perception. Summarily, the artist has re-interpreted the age-old myth to a new mind particularly in enhancing its size. The essentially votive icons, Devi image and those of her Shaktis - subordinate powers, required bolder forms and correspondingly larger canvas. More significant is the deletion of the skyline, which in the earlier painting a blue band on the top symbolised. This skyline, strip of stemmed flowers on the bottom, symbolic of ocean, and the middle space, which the Goddess occupied, stood for three worlds, and, obviously, the enshrining deity for the goddess who commanded them. With the skyline deleted, this painting transforms the background into total darkness except the floral band below. This background symbolises the post-Deluge abyssal darkness, which Mahadevi, the Great Goddess, enlightens by her emergence. The floral band below symbolises the factum of the emergence of light, as simultaneous to sinking the darkness, light - the life in the form of vegetation, begins manifesting from below. This re-interpretation of earlier theme gives to the painting a wider meaning and to the enshrining deity the status of the Adishakti - primordial cosmic energy incarnate. The artist has maintained same tonal values and similar level of brilliance, which besides enhancing painting's symbolic thrust, give it ethnic touch. The background, cleaving which the Great Goddess emerges, is not dark alone but also a formless void. The Goddess is seated on the throne but the throne is not fixed or stationed. It is moving out of the darkness. The glowing golden throne, symbolic of light, is her ambience, and with the emergence of the Goddess, it also bursts as light out of the darkness. The throne is a form as well, and with it, out of the formless void also bursts a form. The Goddess is multi-dimensional and with her emerge also her other aspects, her Shaktis. She is not riding her lion but is seated on her golden throne, which a pair of tigers draws. Metaphorically, the tiger-riding goddess meant an energy-valour combine, the goddess seated on golden throne and a pair of tigers driving it stood for energy bursting with a gust of light and valour carrying it forward. The prior painting does not treat the theme with such wider dimensions, as this. , Vishnu's bow and arrow, lotus and vaijayanti, the long garland of parijata - a celestial flowering plant, and Brahma's quiescence and body-postures. The goddesses on Mahadevi's right and left, though her own manifestations, are in absolute obeisance. The goddess on her right symbolises fertility and manifest nature, and the other on the left, all hidden energies and life.